Hone your target-shooting skills with a military-grade selection of sniper rifles and one-on-one training from a professional instructor. 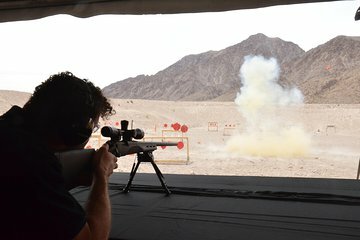 Fire up to five different rifles at ranges as far as 500 yards (457 meters): both long-range targets and exploding targets are provided. The firing line is climate-controlled, for year-round comfort, while your package includes ear protection, eye protection, ammunition, and round-trip transfers from the Strip.